While this is a new term for many, hyperbaric oxygen therapy has actually been around for many years and dates back to 1662. Its use in the clinical setting has been in existence since the 1800s. It originally was tested and developed by the United States Military shortly after World War I. It has been most commonly known for the treatment of deep-sea divers who end up with decompression sickness and has been used for this purpose since the 1930s. 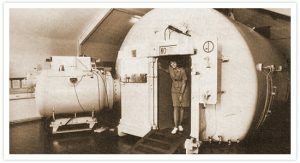 During the 1950s several clinical trials were conducted to see how beneficial hyperbaric oxygen therapy would be for other medical conditions. When one looks back in history it will date back to 1783 when a French physician was reported as the first doctor to use oxygen as a therapy for some illnesses. Since then it has progressed in its use and is used for many different conditions such as assisting in the healing of diabetic foot ulcers, or for the treatment of Autistic children to give them a better quality of life. These are just a few of the examples of where this type of treatment is being utilized. It has also been used in emergency medicine as well as a type of therapy for asthma. There has also been strong indicators that this type of therapy is advantageous to help reverse the after effects of a stroke or head injuries. It is believed that it helps the damaged tissues that take place during these occurrences and also can fight infections and diseases. Basically there are two types of chambers that can be used for hyperbaric oxygen therapy although there are many versions of these. There is the Mono Place chamber that has a acrylic shell to it and holds one person. Then there is a multi-Place chamber which is much bigger and this can hold from 2 to 10 people where those being subjected to the oxygen treatments will merely sit in the chamber.